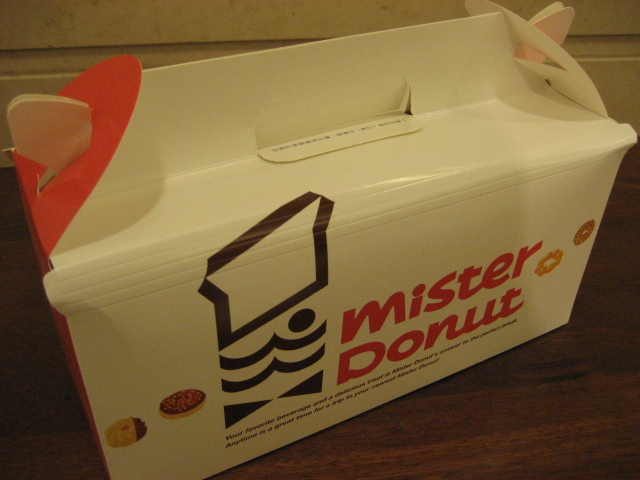 Mister Donut was my first experience with the confection, always after Sunday morning Mass. I developed my love for the very decadent chocolate donut. Alas, they no longer exist out here. Dunkin' Donuts has taken over. The DD flat box is a great innovation: less squishing and less co-mingling of glazes. The French cruller is probably my favorite. It's French in that it's like a pate-a-choux, similar to éclair dough, light and airy and rich at the same time. It is the most labor-intensive donut to make. 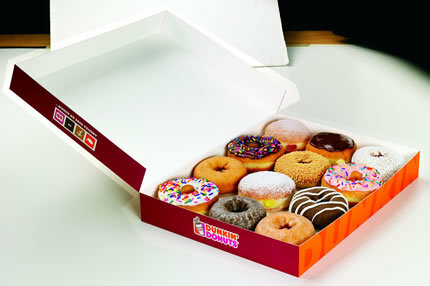 However, it is also low in calories: 150 vs. around 300 for an average cake donut. The sugar raised donut is another favorite. Couldn't find a picture. It is raised with yeast, and thus is airy and light. When I worked in a grocery store as a kid, they made their own donuts. Simple, plain or old-fashioned donuts, fried in lard. They came out warm and crunchy . Major yum. I think most donuts were traditionally fried in lard, as it was cheap, and could take a very high temperature. I haven't met a donut yet that I haven't liked! I picked Bavarian cream, Boston cream, chocolate frosted, maple frosted and vanilla cream filled. I rarely eat donuts though - a couple times a year maybe, but I do love them! We had Mister Donuts down here, too. They were quickly overwhelmed by Dunkin Donuts. With this I must unfortunately disagree. I find it much more difficult to "manage" when I want to take doughnuts to the office for my team, and I have to manage the doughnuts along with backpack, lunch bag, umbrella, etc. The "flat box" ends up in a bag on its end instead of flat. Doesn't do the doughnuts any good. I haven't met a donut yet that I haven't liked! When you get right down to it, that about says it all! I haven't voted because I have no idea what 80% of the stuff is. Here we have chocolate covered donuts, sometimes donuts with white icing on top or those with powedered sugar. That's about it. We have also a pastry that looks like some of the donuts in Paul's pics; the ones without hole. I guess they're the filled ones. Here they are called Berliner and are filled with red jam (raspberry mostly). But sometimes you get them filled with vanilla pudding or advocaat creme. This thread isnpired me to check for a Dunkin Donuts shop in NYC . There is one directly on my way from the hotel to the nearest subway station! You bet I'll go there and have a try at their stuff. This totally changes my understanding of that historic moment. According to an urban legend, Kennedy allegedly made an embarrassing grammatical error by saying "Ich bin ein Berliner," referring to himself not as a citizen of Berlin, but as a common pastry. Kennedy should have said "Ich bin Berliner" to mean "I am a person from Berlin." By adding the indefinite article ein, his statement implied he was a non-human Berliner, thus "I am a jelly doughnut". The legend seems [to stem] from a play on words with Berliner, the name of a doughnut variant filled with jam or plum sauce that is thought to have originated in Berlin. It is not widely known among Germans, who consider Kennedy's speech a landmark in the country's postwar history. It's worth recalling, again, President John F. Kennedy's use of a German phrase while standing before the Berlin Wall. It would be great, his wordsmiths thought, for him to declare himself a symbolic citizen of Berlin. Hence, Ich bin ein Berliner. What they did not know, but could easily have found out, was that such citizens never refer to themselves as "Berliners." They reserve that term for a favorite confection often munched at breakfast. So, while they understood and appreciated the sentiments behind the President's impassioned declaration, the residents tittered among themselves when he exclaimed, literally, "I am a jelly-filled doughnut." 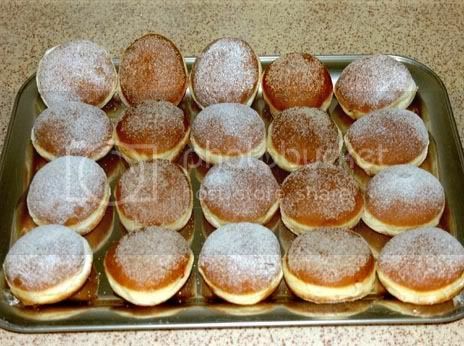 In fact, the opposite is true: The citizens of Berlin do refer to themselves as Berliner; what they do not refer to as Berliner are jelly doughnuts. While these are known as "Berliner" in other areas of Germany, they are simply called Pfannkuchen (pancakes) in and around Berlin. Thus the merely theoretical ambiguity went unnoticed by Kennedy's audience, as it did in Germany at large. 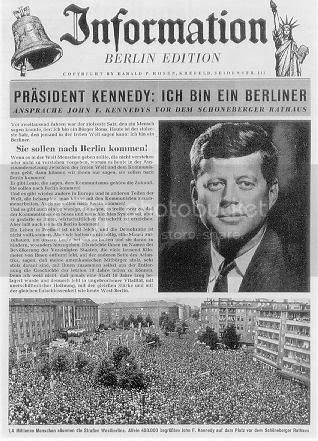 In sum, "Ich bin ein Berliner" was the appropriate way to express in German what Kennedy meant to say. Although it is false, the legend has since been repeated by reputable media, such as the BBC (by Alistair Cooke in his Letter from America program), The Guardian, MSNBC, CNN, Time magazine, The New York Times, in several books about Germany written by English-speaking authors, including Norman Davies and Kenneth C. Davis, and is even mentioned in a stand-up show by Eddie Izzard. As for the creation of the speech, it had been reviewed by journalist Robert Lochner, who was educated in Germany, and had been practiced several times in front of numerous Germans, including Berlin Mayor Willy Brandt. 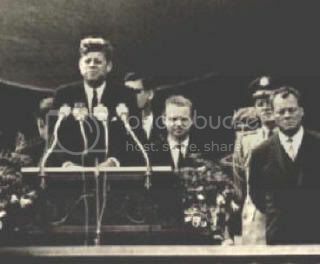 The many video and audio recordings of the event show only enthusiastic applause following the statement; the only laughter occurred later, when Kennedy jokingly thanked his translator for his translation of Kennedy's German sentence into German. 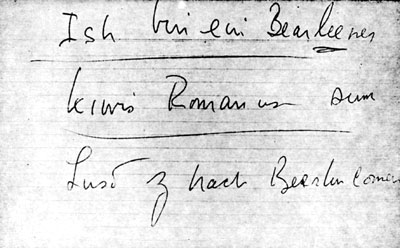 John F. Kennedy's phonetic transcription of the German and Latin phrases in the Ich bin ein Berliner speech, West Berlin, 1963.During the speech Kennedy used the phrase twice, ending his speech on it. However, Kennedy did pronounce the sentence with his Boston accent, reading from his note "ish bin ein Bearleener," which he had written out in English phonetics.